I don’t end up cooking much meat so I’ve never brined meat before but there’s a first time for everything. I was excited for a new technique. I set the country style boneless pork ribs set up in brine for the workday. 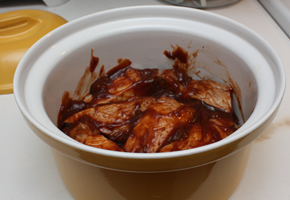 The pork should absorb a lot of liquid and when this cooks off, the meat will be more tender. True story. Add salt and sugar stirring until dissolved. Add ice cubes and peppercorns. 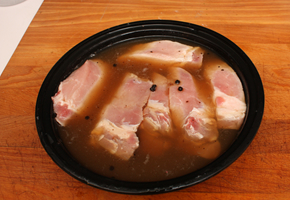 Put pork into the brine and let sit for 8 hours. 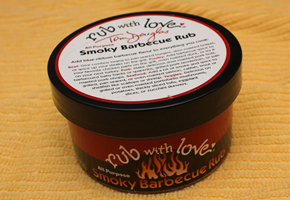 To cook, remove from brine, smother with bbq sauce and bake for 1 hour, covered. The pork came out smelling amazing! It was uber tender. Fork tender…no knives required. 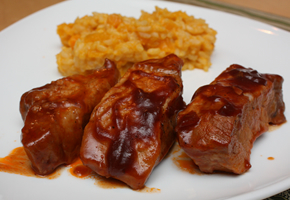 It would have been really special with homemade barbecue sauce but was so good and I was really happy with it. 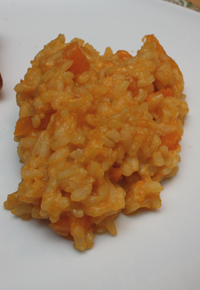 I made butternut squash risotto to go with it. I love risotto and don’t make it nearly enough. 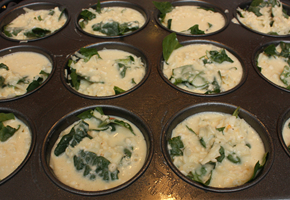 It is creamy and delicious with so many variations! I’ve made a weight watchers one with tomato juice and zucchini. 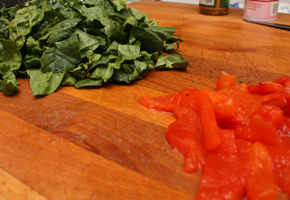 The tomato juice makes it red, flavorful, and creamy without being overly acidic. Enough about that, onto today’s risotto. Toast aborio, stirring consistently until golden. Heat broth and wine on medium low. 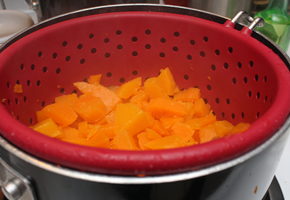 Steam butternut squash and add to rice. Add ½ cup broth until absorbed and repeat until all the liquid has been absorbed. The risotto was sticky and delightful. The squash was a perfect addition. What a great orange color! Needless to say, I ate leftovers for days. 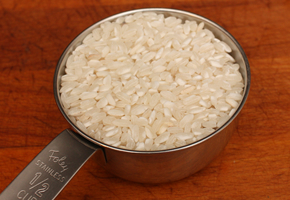 I thought making a ½ cup of rice might be weird to have strange quantities but we definitely had more than enough. Maybe arancini will be a fun use of these leftovers. Mr. J and I had a simply wonderful day feeling famous during our engagement photo shoot. Seriously. At times the lens on the camera was about the length of my arm and people were looking to see if we were famous. I was nervous but it was SO fun. Afterwards we were “all dressed up with nowhere to go”. Well, we weren’t super dressed up so we could pretty much go anywhere! We broke out a Groupon for Boston Burger Company and could just stroll there from our apartment. We got even more excited while we waited in a crowded hallway of the tiny restaurant. We scoured the menu while we waited so it definitely felt like we earned it.Our meal started with an appetizer of mac and cheese bites. So amazing and cheesy. The noodles were the slightest bit al dente. Marinara dipping sauce always seems weird to me with these but the citric acid is a great contrast. We got fries, not because we actually needed them but how could we pass on one of the 12 variations? Most of ‘em came home with us but they were delicious! We got garlic Parmesan and really loved them. They were thick cut and had a strong zing of garlic which I love! 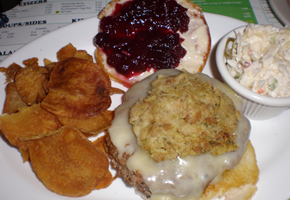 I chose “The Pilgrim” which is a turkey burger with homemade cranberry mayo, stuffing, and American cheese. I swapped out the cheese for cheddar 1) because I like it better than American cheese and 2) because I thought the sharpness would be nice against the sweet and tart cranberries. 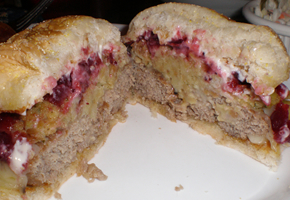 It was so great to see such a substantial amount of cranberry spread on there. I was really impressed and loved every bite. Ohh, you’d like to see a cross section? Sure! Mr. J got the “Ranch Burger”. 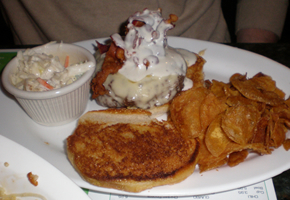 It was a beef patty with bacon, American cheese, and ranch dressing. He really loved it. The bacon was piled high but didn’t seem like it was over the top. Normally he leans towards burgers with without cheese but with blue cheese crumbles or blue cheese dressing. Did you notice the buttery grilled bun? Yum! The burgers come with coleslaw or baked beans (we went with the slaw, which was good). 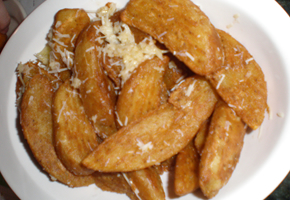 They also come with homemade potato chips. These were really impressive! I loved how much the rich potato flavor came through! The waitstaff was so great. I’ve waited tables and these ladies knew what was up. It is such a small restaurant but there was a really bubbly vibe. Luckily we could mosey on home after filling up while toting to-go boxes. I already know what I want to get next time. Let me profess my love to the pizza stone! It has changed the way I make pizza and I just can’t wait to make more! I’ve been dying for one and I make pizza and calzones regularly so it was just a matter of time. 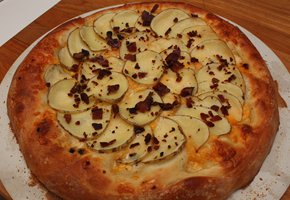 I made this awesome Potato Pizza that I’ve made before and it seemed like a whole new pizza! The dough was just a refrigerated dough ball from the grocery store but it baked so differently on the stone! It was fluffy and doughy and the outside and bottom was beautiful and crispy. My mum gifted the stone to me and I am truly excited. 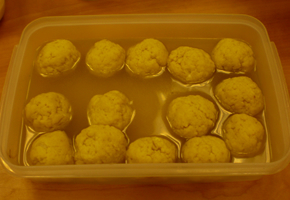 I was very careful to not put the stone into a hot oven (it’ll crack) and not to use dish soap (it’ll absorb it). Since it’s only for pizzas, calzones, and the like, I’m sure we’ll live a long and happy life together. 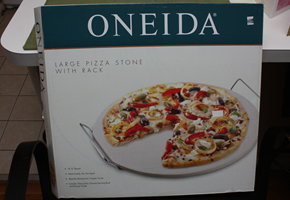 Also, Oneida brand holds a special place in our hearts since Mum grew up in Oneida, NY. Spoiler altert: I wasn’t sure I was getting it off but thankfully with a few knives and spatulas, I did. Phew! It was a scary few minutes though. I should have oiled my new stone more. Preheat oven to 425 and put pizza stone into the cold oven while preheating if using a stone. 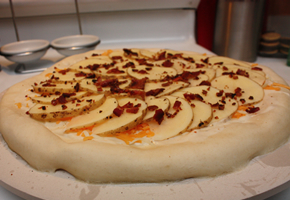 While the bacon is cooking, allow dough to get to room temperature. 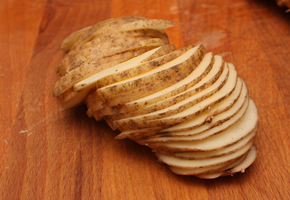 Finely slice a potato into paper-thin slices (look how well I did even without a mandolin!). 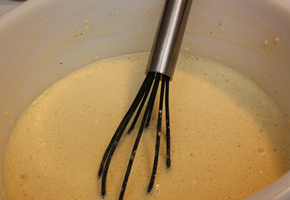 Spread dough out and top with alfredo (or garlic & oil spread). 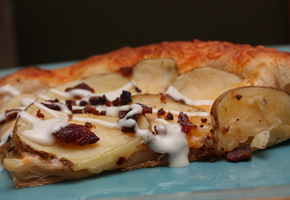 Layer cheeses and potato slices over the top of the pie before topping with chopped bacon. Bake 30 minutes at 425. This pizza is a great change from the norm. There’s nothing healthy about it but it is comforting and delicious. I cannot believe how much the dough puffed up! It was shocking and super exciting to see it happening! I really have to exercise some constraint to NOT open the oven the whole time to peek in and smell it coming together. The hotter the oven, the better the pizza. The potato cooks pretty quickly since it is so thin but I didn’t overlap them very much either. 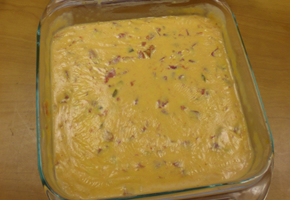 We top it with a little drizzle of ranch dressing but have topped with chives before too. It is so good and I highly recommend making it. Omit the bacon and voila, you have a vegetarian one! Pizzeria Uno’s has an appetizer of a deep dish pizza that is a “stuffed potato” using mashed potato, cheddar, and bacon…now that I also have a deep dish pan maybe that’ll come soon too! I love that pizza makes such great leftovers and is amazing the next day for lunch! 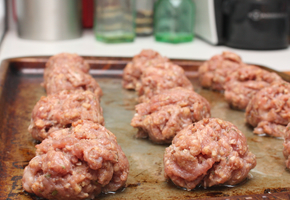 I made meatballs for the first time ever. 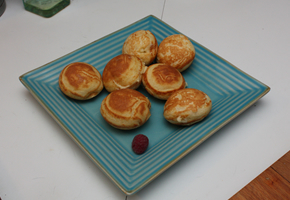 Well, not never, but I made them by myself for the first time. I can’t eat red meat so if I want meatballs, they have to be turkey and it usually means I eat them at home after buying them. 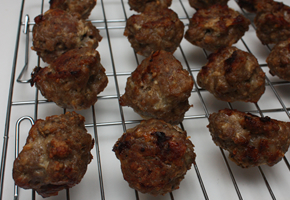 When I was little I remember making meatballs. My mum would put all the ingredients into a bowl and dad would let us help roll and cook them. I think as a kid I probably thought she was “letting us help” but it was probably more that she doesn’t like to handle meat with her hands because of the “ick” factor. We would get some cooking and then make a big one with all the remaining mix and giggle relentlessly before continue to roll them. Even after buying some frozen turkey meatballs at Trader Joe’s (theirs are the best!). 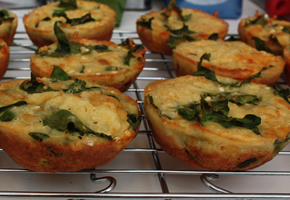 I decided to make some and they were AMAZING, if I do say so myself. 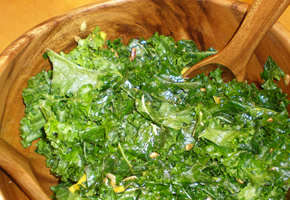 This is a prime example of a simple meal, made with really great ingredients, and letting them speak for themselves. Mix bread crumbs and milk. Let sit a minute. 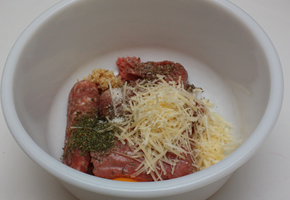 Combine ground turkey, sausage, egg, parsley, garlic, Parmesan, wine, salt and pepper. 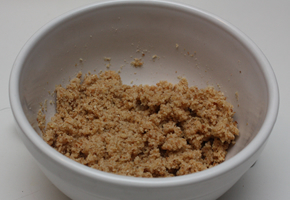 Add breadcrumb mix and combine well. Form into balls depending on your size preference. I went with larger ones. Heavily oil a baking sheet. 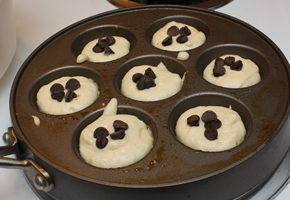 Bake 30 minutes at 375 degrees, turning every 10-15 minutes to evenly brown. I was so happy with these! I thought sausage would provide enough fat for moist meatballs instead of proscuitto or bacon, but those would be good too. I was super diligent about turning them to ensure that they cooked evenly. 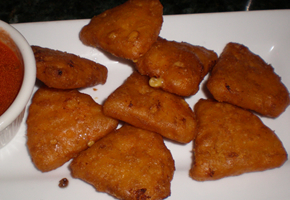 I could have fried them but baking them was way easier. I’ll continue to purchase them but they weren’t a big deal to make myself. The wine was a HUGE flavor enhancement. A few glug glug glugs of a pinot noir that was already open definitely added some depth of flavor. They smelled simply amazing! 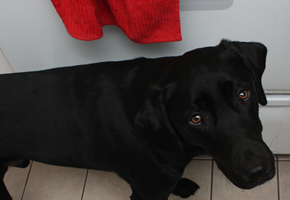 Have you met my sous-chef Windsor? He was standing by, under my feet in our tiny kitchen as usual. I think he was super excited to see what delicious item was coming out of the oven! Even with that cute face he still doesn’t get anything I make. Part of my inspiration to make some came from another blog I love We Are Not Martha. Theirs were featuring prosciutto and were pan fried. I literally read the recipe and thought, ooo red wine would be good with these as I channeled my wine-loving college roommates as inspiration. Parsley isn’t my favorite so I just used dried parsley. Rosemary would be good. I served these with a basic red sauce and spaghetti. I thought my meatballs were good enough and deserved to shine! I’m so proud! 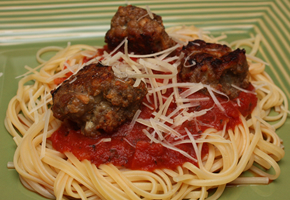 I didn’t make a ton of meatballs but now that I know this recipe is a winner I’m sure I’ll make more and freeze them. 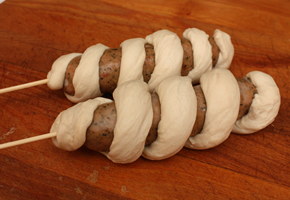 I will probably also make some cute little ones to freeze for appetizers or soup. They aren’t that much effort and I keep thinking about all the exciting additions! 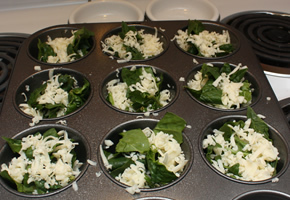 Spinach very finely chopped would be good, sun dried tomatoes, maybe a little nugget of mozzarella? Mmmm the possibilities are endless. I also love sweet & sour meatballs which would definitely highlight these guys. Once upon a wintery Saturday night, some friends hosted their annual Wine-off. This competition is not your average wine and cheese night. This is a night each couple brings their a-game in the form of an inexpensive wine ($15 or less per bottle). Each is covered and everyone drinks & scores. There were 16 entries before the crowning of the best as well as the Golden Stink Award. I was really looking forward to this after thoroughly enjoying it last year AND it was a fun night out after a big work event that day! I’m the wine drinker of the apartment so I pulled a wine out of my wine rack to bring. I never spend more than $15-per-bottle anyway so I was all set! 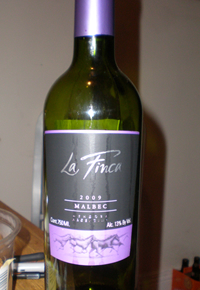 I chose a Malbec, thinking it would be a crowd pleaser and would hopefully score well.Malbecs are a grape variety originally from the Bordeaux region of France but more recently grown in Argentina for this red wine. It pairs with food very well and will stand out against ordinary Merlots or Cabernet Savignons. We scored just above the middle of the pack. I wish we brought a chilled white wine since there were so few and after alllll the wine they were refreshing and different. a scoring method to calculate results quickly! 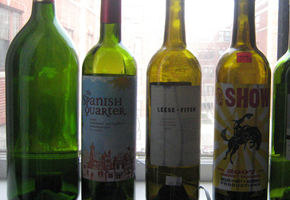 Invite your friends to bring cheap wines to your cocktail party. 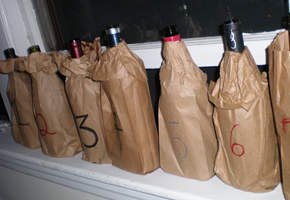 Have extra wine bags on hand to conceal the wines. 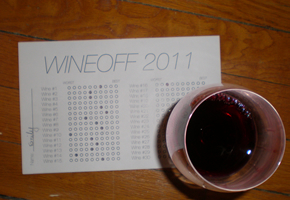 Make a score card and prepare to tally the scores at the end of the night. Presto, you have a wine-off! I love opportunities to have lots of opinions and try new things! I was so impressed with Miss M’s scorecard. They were so professional it made me anticipate a scantron machine to tally our choices! Cardstock? Bubble choices? Wow! Miss M & Mr. R also invited guests to submit a song to the playlist for the night. What a great idea? It was super fun to hear a wide variety and see reactions when somebody’s song came on. 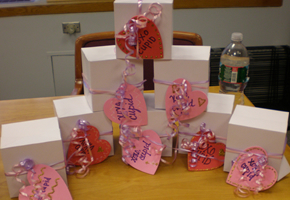 It’s not too late to message your friends and have an impromptu Valentine’s Day get together, or anti-Valentine’s day bash! Careful, it is Monday. This is a great winter party. I had a small Pumpkin Beer tasting around Thanksgiving which was a lot of fun. I’m thinking about some sort of taste-off for my birthday. I know a few of you felt cheated with the Brownie post. In an effort of full disclosure: I love all food. I love to make things myself and I love that which others make for me too. There are not as many restaurant reviews as I originally anticipated but winter in New England makes us hole up inside sometimes. I’ve been sick so I agree that my recent posts are not all AMAZING. The other night I did make a pretty amazing meal. 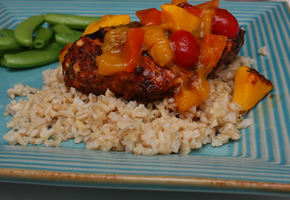 Without further ado…I present to you: Smoky Grilled Chicken with Mango Salsa. Boo-yeah. 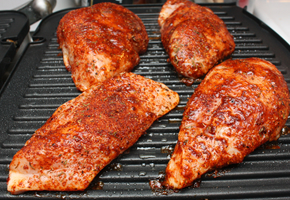 Marinate the chicken and then dredge into the rub. 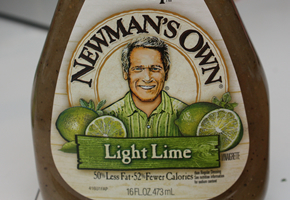 I used my fav lime salad dressing and a rub blend I got Mr. J in Seattle from the famous Chef Tom Douglas. 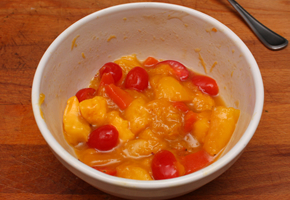 Chop the mango, tomato, roasted red pepper pieces. Add vinegar, oil, sugar, and red pepper flakes. 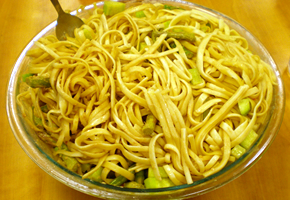 Roughly mix with a fork to incorporate all the flavors. Let stand while chicken finishes cooking. Serve over rice with salsa spread on top. This was so easy and was wonderful! The chicken was veryyy spicy because of the rub but I liked that combo with the sweet salsa. Mr. J may not have been expecting the kick during his first bite! I hadn’t been sure what to make for dinner when I defrosted chicken early that morning but this was almost all pantry/freezer items! I used frozen mango chunks that I keep handy for smoothies or when we’re just out of produce and I’m in fruit-withdrawal. Since mango can be so pulpy or fibrous I probably should have chopped it while frozen, but I didn’t care that it wasn’t perfect. Pineapple would be a great alternative! We ate the chicken & mango salsa over instant brown rice to cut the spice. I steamed some pea pods on the side. 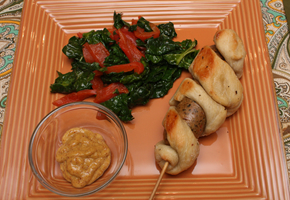 I really enjoyed this flavorful & instant dinner! It was refreshing and was a perfect amount. I’m not a baker so I just LOVE baked items from others! I also love saying thank you with food. I’m lucky that at work we were thanked with food! 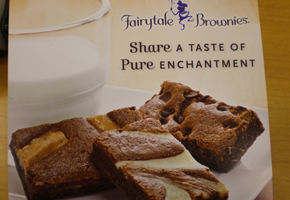 We got a mixed box of Fairytale Brownies.Yay for treats in the conference room. Also, it happens to be a very warm part of the office so these delicious brownies seemed more like freshly baked goodies! 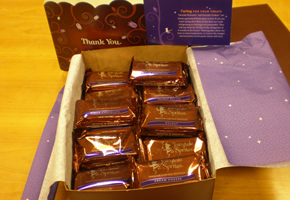 We received a big box of snack-sized brownies. Snack size was perfect sample a bunch of different flavors. My favorites were toffee crunch and espresso nib. Nib: (plural) crushed cocoa beans. Who knew? Now you can use that in Jeopardy. These will be a fun thing to send, especially for a group!